If you saw the Tarantino / Rodriguez ‘Grindhouse’ double feature I’m sure you will vividly remember Edgar Wright and Simon Pegg’s trailer for their fictitious film ‘Don’t’. Arguably the best thing about ‘Grindhouse’, which I did enjoy, was the trailer for ‘Don’t’. Now we have director Ti West’s 80’s period piece ‘The House of the Devil’ which to its credit pretty much had me yelling ‘Don’t!’ at its main character for almost the entire movies running time. When we first meet Samantha (Jocelyn Donahue) she is being shown a quaint little crib by a landlady played by the legendary Dee Wallace. At least she’s a legend to me. The house is perfect and much needed for Samantha, especially considering her slovenly whore of a roommate, but unfortunately Samantha needs to come up with some fast cash to make the first month’s by Monday. What’s an unemployed college student to do? Don’t pull of that tear-off on the poster board looking for babysitter Samantha… DON’T DO IT!!! Samantha does it. After a few missed connections this cat calls Samantha for the gig so Sam and her girlfriend Megan (Greta Gerwig) drive out to East Boondock Hell to the house of the Ullman’s, a lengthy drive which does have Megan a little bit concerned. Now if Samantha and Megan knew what I know, that being that the Ullman’s were being played by actors Tom Noonan and Mary Woronov, they would’ve known that anything with those two actors in it couldn’t possibly lead to anything good and they would’ve hopped right back in Megan’s Volvo and motored away. They don’t do that. Even when Mr. Ullman tells Samantha that this ‘baby’ she will sitting for is some eighty year old woman. DON’T STAY SAMANTHA! you need to see! Don’t listen to The Fixx on your eight pound Walkman Samantha… That’s devil music girl! Do you gotta pee right now Samantha? Don’t pee right now, don’t go in the basement and for the love of God don’t lie in that Star of David! Samantha didn’t listen to any of that sage advice. Now look at her. All f**ked up. I had heard some of the positive buzz about this movie from young director Ti West, with folks calling this an homage to 80’s horror. And they have said this quite loudly and with a lot of conviction. But aside for the hair, pop music and eight pound walkman is this really an 80’s style movie? I don’t think so, no matter how loudly folks yell out. This is certainly a period horror movie and it may take place in the 80’s but to me it seems more in the style of the late sixties, early seventies horror movies considering the look, feel and pacing of this movie. Yeah, we had ‘Don’t Answer the Phone’ and ‘He Knows Your Alone’ which were made at the birth of the 80’s and while those movies may seem similar to this, those were slasher flicks and I think we all know that 80’s horror IS the slasher flick. This is an occult horror flick which is seventies horror. Just my two cents. 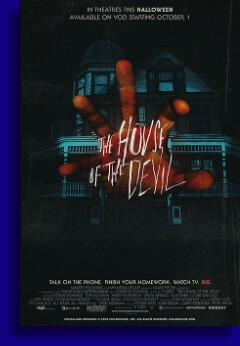 But all of that rigmarole aside is ‘The House of the Devil’ any good? Actually it is pretty good. I don’t know if it’s the be all end all stunning horror masterpiece that I heard it was, proclamations which forced me out of my easy chair and into the theater to watch it, but it does have style, it has suspense, it has Mary Woronov and it has eight pound walkmans strapped to the beltline of cutie pies with feathered hair and Calvins. All that alone is almost enough to get this movie by. Let’s start with the cutie pie with the feathered hair and the eight pound walkman. Jocelyn Donahue does play the role of Samantha just about perfect, doing absolutely nothing that any reasonable thinking person would do in a big empty house all by their lonesome, things that prompts plenty of ‘Don’t’s’ and keeps the suspense high and tension fairly high. High tension is necessary in this movie because there is not a lot happening here on the surface. If you’re not buying into Samantha doing what she’s doing then you will be bored out of your mind because you will be stuck watching Samantha listen to her walkman, do some homework, watch TV and eat nasty pizza. In addition to Samantha not doing a heckuva lot, there’s not much story here to support this movie either. We know that the Ullman’s are up to no good, simply because they have to be, and since the movie is called ‘The House of the Devil’ we can surmise that Satan is involved in some kind of way, but almost everything by way of plot in this movie is wide open and subject to personal interpretation because they aren’t telling us jack. I also wouldn’t have been all that upset if West had pared down watching Samantha do nothing in exchange for watching Woronov and Noonan do more. Since you have these horror veterans in your horror movie, might as well take full advantage of them baby. But while ‘The House of the Devil’ has its flaws, with almost all of these flaws centered around a very sketchy narrative, it is still a wonderful exercise in style and suspense, if not necessarily an exercise in fear. Still, this is an exercise that I think is very much worth seeing.